Whether you love to see the colours of autumn leaves on the big screen or want to give yourself a fright following Halloween night, there are many reasons why Fall is one of the best movie seasons. The later in the calendar year a film is released, the fresher it is in the minds of Academy members, and so many films tipped for Oscar glory tend to arrive in cinemas during the autumn months. Similarly, when it comes to home movie enjoyment, there are numerous classics ranging from Halloween capers to feel good comedies set against a stunning autumnal backdrop. Released in 1989, this classic features the late, great Robin Williams as a teacher helping boys at a prestigious private school reach their potential. The movie is memorable for a standout performance from Williams, a heartwarming script (“Oh Captain, my captain,” anyone? ), and of course the beautiful autumnal colours on campus. Sticking with academia, autumn, and Robin Williams, Good Will Hunting is another classic that warms the heart as much as a nice mug of mulled apple cider. The debut outing from then-unknowns Matt Damon and Ben Affleck was a hit with the Academy, and the tale of genius janitor seeking help from therapist Sean Maguire (Williams) is not only a beloved story, but also a film that is widely believed to be one of Williams’ best. When Hocus Pocus was released in the summer of 1993, perhaps unsurprisingly, it flopped. 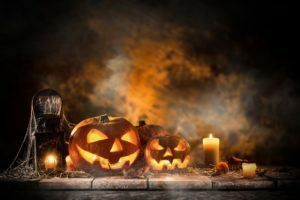 It was undoubtedly a strange time to release a Halloween movie, but despite the absence of commercial success, the film has gone on to become a cult classic – frequently appearing on lists of best Halloween movies of all time. Everyone’s favourite family of macabre oddballs hit the big screen in style in the 1990s, and the films have spawned endless Halloween costumes ever since. With an all-star cast, a memorable soundtrack and an infamous dance scene, this feel-good family comedy is a great watch to get you in the spooky spirit. Of course, for those who take their frights seriously, the horror flick Halloween is an easy way to take things up a notch. One of the first mainstream slasher movies, the now iconic horror flick was released in 1978 and introduced audiences to serial killer Michael Myers for the first time. Tim Burton’s stop-motion fantasy film arrived on screens in 2005, telling the tale of a bridegroom who slips into the land of the dead before he’s about to be wed. It was met with critical acclaim as well as commercial success, and is a perfect flick to get you into a spooky mood. Take your pick! The 1984 original is packed with plenty of ad-libbed greatness from Bill Murray, while the 2016 remake is filled with up-to-date special effects and of course an all-star, all-gal leading cast. In addition to bringing the laughs, the movies also bring us one of the best-loved songs bound to fill Halloween party dancefloors. This classic Rom-Com was a Box Office Hit. When you’re not enjoying the chemistry of Tom Hanks and Meg Ryan as business-rivals-slash-internet-lovers, you can marvel over how beautiful NYC looks in the fall. And now, back to horror. If the thought of sitting through a Rom-Coms is your idea of scary, turn on this classic nineties slasher! Blending elements of black comedy with violence inspired by true events, the movie was a commercial success around the world and also scooped numerous awards. Fans of Burton’s stop-motion efforts will no doubt have seen this classic film. When Jack Skellington accidentally wanders from Halloween Town to Christmas Town, he can’t help but celebrate the holiday – with of course, comical and calamitous consequences. If you want a festive flick that will help you commemorate Halloween whilst also getting you in the Christmas mood, this is a great choice.